The wines bearing the 'Savoie' designation are from an area in France just below the Swiss border. 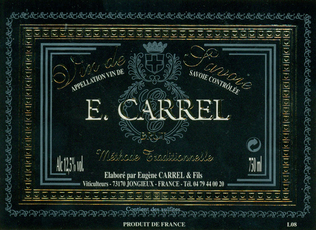 Domaine Eugene Carrel & Fils is located in the village of Jongieux, about 40 miles southwest of Geneva, Switzerland. Eugene now manages the estate with his son Olivier and son-in-law Sebastien. The Carrel vineyards are situated at an average elevation of 1,000 feet and planted on steep, southwest facing slopes in calcareous clay soils of Chavaz Mountain (also known locally as the "Hot Mountain"). Despite their proximity to the Swiss Alps, the climate is surprisingly warm - the nearby village of Jongieux enjoys 2-3 more hours of sun than any other area in the Savoie. So, unlike many grape-growing regions that specialize in sparkling wines, the fruit reaches phenolic ripeness which diminishes the need for added sweetness before bottling. The Carrel vineyards are planted with indigenous varietals: Jacquere (sold as Vin de Savoie Jongieux Blanc), Altesse (aka Roussette de Savoie), Gamay and Mondeuse. 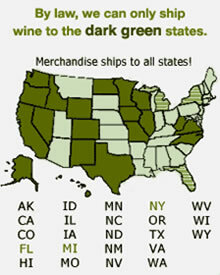 The majority of Carrel's wines are vinified in stainless steel tanks to maintain freshness, aromas and flavors. A small selection is aged in oak barrels to lend additional depth and structure before being blended with the greater whole. An elegant, mild bubbly with a smooth bead of long-lasting bubbles. Aged for 24 months before release. A golden color leads to a floral and fruity nose, mouth-filling texture and a hint of mineral on the finish. Good times. Belly buttons. Hot tubs. And foods of all types. A wine designed to celebrate all that is good about being human.